Mountains have always attracted naturalists because of their strikingly high biological diversity and number of endemic species. A high diversity of plants can be at least partly explained by more frequent speciations of mountain species, but it is not clear what are the drivers of this process. For instance, recent studies suggest that the mainly-mountain genus Primula is species rich because in this genus small and geographically isolated populations easily became separate species (allopatric speciation). On the other hand, the alpine genus Phyteuma may be rich partly because ancestral populations often faced ecological differentiation (sympatric speciation). Evidences for different drivers of diversification come typically from single evolutionary lineage (e.g. a plant genus) or restricted areas, and they cannot be generalized across whole mountain floras. In this project, I take benefit from on-going projects that collect genomic data of whole European mountain ranges (PhyloAlps) or countries (PhyloNorway, data collection from Spain), merge them together and fill in a blank spot on a map on the Balkans peninsula, where no quantitative genomic survey was performed so far. Including species from the Balkans, I obtained a complete sampling across seven evolutionary lineages of European high mountain plants, and will use it for analysing their evolutionary dynamics simultaneously. With this data, it is possible to investigate whether mountain plant species are typically formed by geographic isolation of populations (allopatric speciation), ecological differentiation or other population level mechanisms (sympatric speciation). It is also possible to explore whether intensive diversifications in mountain flora took place mostly in ice ages (glacial periods) when plant populations were scattered across isolated islands of suitable habitats (glacial refugia), or interglacial periods. Understanding the origins of species in mountain flora and its historical dynamics is crucial for efficient conservation planning of mountain plants in future. With the help of the Bourse de Terrains SFE, I have sampled plants from localities in Slovenia, Croatia, Bosnia and Hercegovina, Montenegro, Serbia and Bulgaria. 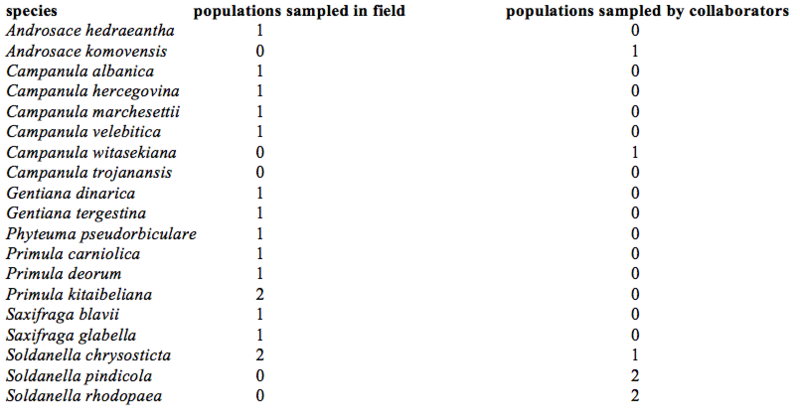 During this field survey I sampled almost all planned Balkanic species, which together with existing genomic databases cover large majority of species in above mentioned seven evolutionary lineages. All samples are currently send for molecular analyses and the genomic data are expected to be ready in few months. Mountain biomes have long attracted the interest of biologists, partly because they encompass higher species diversity than their adjacent lowlands. This high diversity likely results from specific diversification dynamics – from increased speciation rate or decreased extinction rate. Especially in European mountain systems, development of mountain floras seems to be intricate interplay between different speciation processes (Schneeweiss et al. 2013, Boucher et al. 2015), migration (Kolar et al. 2015), and survival of species during glacial periods (Stehlik 2003). However, studies discovering importance of those processes was typically performed only for one specific group (e.g. Primula and allopatric speciation in Boucher et al. 2015). To attain more general insight, whole floras certain European mountain systems are currently being sequenced in large genomic projects, e.g. PhyloAlps initiative for Alps and Carpathians, PhyloNorway initiative for Scandinavian mountains or projects aiming on genomic databases in Iberian peninsula. Weak point of this approach however is that European mountain ranges are interconnected and communicating, rather than isolated systems (Kadereit et al. 2008), and for understanding diversification dynamics in one mountain range, information from the other areas is also needed. To fill in gap between those two types of studies, I decided to merge data from existing genomic databases, and select clades of mountain plants for which I will attain complete clade sampling, including regions missing in those genomic databases. For purpose of this study I identified seven groups of plants that (i) inhabit mostly high mountain habitats (ii) are known or believed to form monophyletic European clade (iii) are relatively species rich (iv) do not have extremely specific life histories (asexual groups, ferns, orchids). Groups fulfilling those criteria are Soldanella, Primula sect. auricula, Androsace sect. aretia, Phyteuma, Campanula sect. heterophylla, Gentiana sensu stricto, Saxifraga sect. Saxifraga. The large majority of species from these groups is already covered in above mentioned genomic databases, but I was systematically missing species from Balkans peninsula, where no large genomic project took place so far. Having data from Balkans is crucial for my project, as this region is considered one of important glacial refugia and also a plant species migration route between Asian and European mountains. 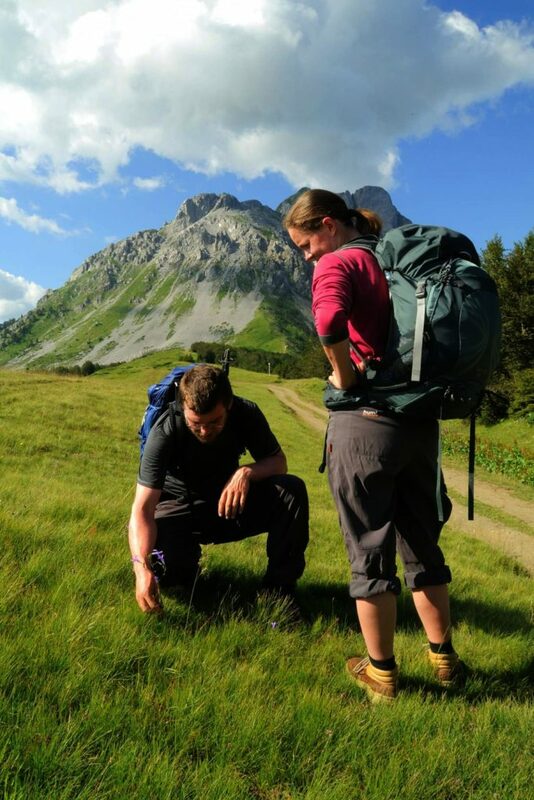 The aim of this fieldwork project was thus sampling Balkanic endemics from above mentioned high mountain groups for subsequent sequencing in PhyloAlps project framework. With data from species from the Balkans collected in this project, I will be able to use above mentioned seven mountain plant groups and compare dynamics and modes of their diversification processes. This strategy can bridge the lack of generality in single clade studies on one hand, and attain complete clade sampling typically unavailable for whole-flora studies on the other hand. Figure 1. 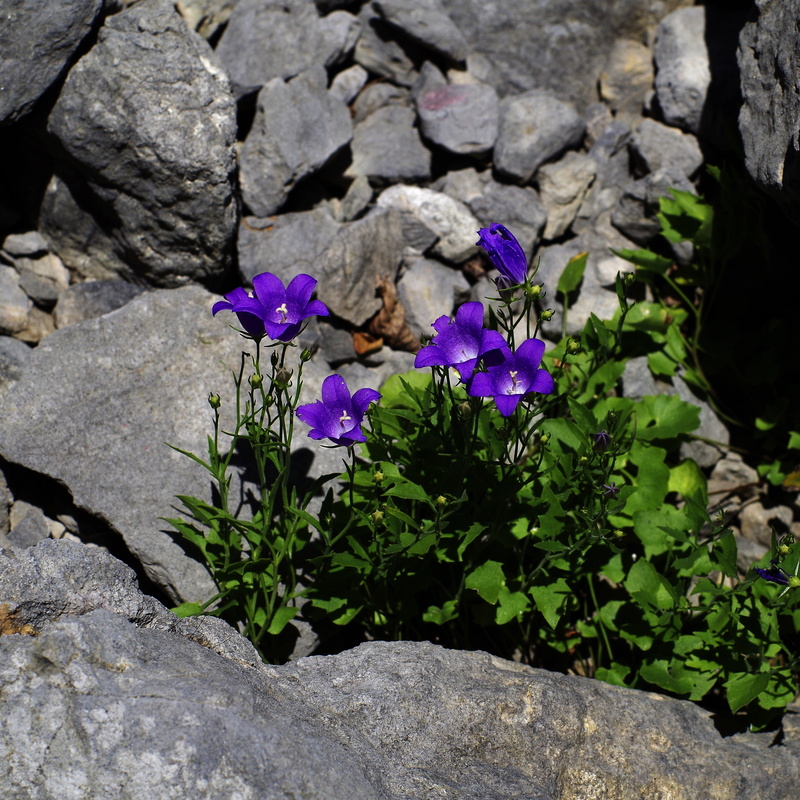 Campanula hercegovina, an endemic of border mountains between Croatian and Bosnia can be found in moving scree fields of limestone. Detailed description of localities of all focal species were obtained from former excursions to those localities, records from local flora, georeferenced photography or herbarium record. Fieldwork was done by travelling by car in a team of three people (me, Marie Smyčková, Doubravka Požárová). We collected biological material from one or two individuals of each focal species and stored it in silica gel for further molecular analyses. Dried specimens are currently used for DNA extraction following modified Macherey-Nagel NucleoSpin Plant II protocol that has been optimised for the best performance across many different plant groups. Extracted DNA will be send to Genoscope Centre Paris, where the material will be sequenced by next-generation sequencing technology. This approach was successfully used for sampling across plant species in the Alps within PhyloAlps project. Once genomic data has been produced, I will assemble de novo and annotate the complete chloroplast genome and the ribosomal nuclear DNA regions using a bioinformatic pipeline already developed for this purpose in the PhyloAlps project. Phylogenetic inference will be conducted based on aligned sequences, and dated phylogenies will be obtained with fossil calibration using suitable software such as BEAST (Drummond et Rambaut 2007). Comparative analyses of species diversification, trait and niche evolution will then be conducted with up-to-date methodologies (Morlon et al. 2014). Figure 3. Summits of Komovi mountain range in Montenegro. This hardly accessible landscape of rocks and screes hosts endemic species like Androsace komovensis or Saxifraga glabella. The field sampling in the Balkans peninsula helped me to cover species from above mentioned high mountain lineages in the region from which I could not get data by other means. During the vegetation season, me and my collaborators performed two sampling campaigns in the Balkans peninsula. The main fieldwork took place between 25/7 and 15/8 and covered species in Bosnia and Hercegovina, Montenegro, Serbia and Bulgaria. Second small fieldwork in Slovenia and Croatia took place between 25/8 and 30/8. During those two fieldworks we succesfully collected all focal species from the region (for details see tab. 1), with exception of Campanula trojanansis that proved to be insufficiently described species that could not be identified in field, and Androsace komovensis, Campanula witasekiana, Soldanella pindicola and S. rhodopaea that I obtained sampled from our collaborators, so there was no need to repeat the sampling. In addition to endemics for Balkans peninsula we also collected several species, that were already sampled in the projects PhyloAlps or PhyloCarpathians (e. g. Gentiana utriculosa, Androsace villosa, Phyteuma orbiculare), and will serve a control for consistency of species definition across the dataset. Including the Balkans sampling, I currently have sampled majority of European mountain groups Soldanella (100% coverage), Primula sect. auricula (100%), Androsace sect. aretia (86%), Phyteuma (100%), Campanula sect. heterophylla (96%), Gentiana sensu stricto (96%), Saxifraga sect. 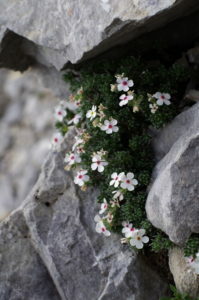 saxifraga (87%). Figure 4: Androsace villosa, a limestone rock specialist widespread across Eurasian mountain systems. Figure 5. 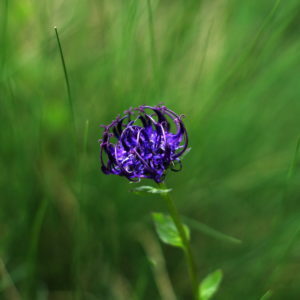 Phyteuma pseudorbiculare, an endemic of western Balkans, is closely related to Phyteuma orbiculare known from other European mountains. Figure 6. 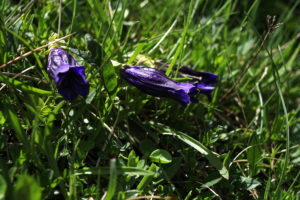 Gentiana dinarica, an endemic of western Balkans, is a typical inhabitant of alpine meadows on calcareous soils. Figure 7. Summits of Midjor mountain range on border of Serbia and Bulgaria. Although the elevation is comparable to western Balkanic mountains, a different geological history resulted in more rounded shapes. Figure 8. 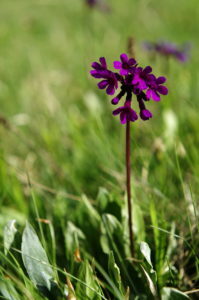 Primula deorum, an ornamental endemic of Rila mountains in Bulgaria, is a typical inhabitant of wet meadows and larger snowbeds. The samples are being extracted at the moment and will be send for sequencing during November or October, and I expect to get the sequence data in February. Once having sequence data from Balkans and the other regions, it will be possible to build from them dated phylogenies. Fitting those phylogenies with diversification models, I will explore whether rate of diversification is connected with climatic and geological events as is Alpine orogeny or climatic oscillations in the Quaternary, and whether such response is consistent across all groups. Also it will be possible to address frequency of different speciation mechanisms (allopatry vs sympatry) or connection of rates of diversification and molecular evolution. In addition to those main aims, the collected dataset is also extremely valuable for systematicians interested in certain groups. 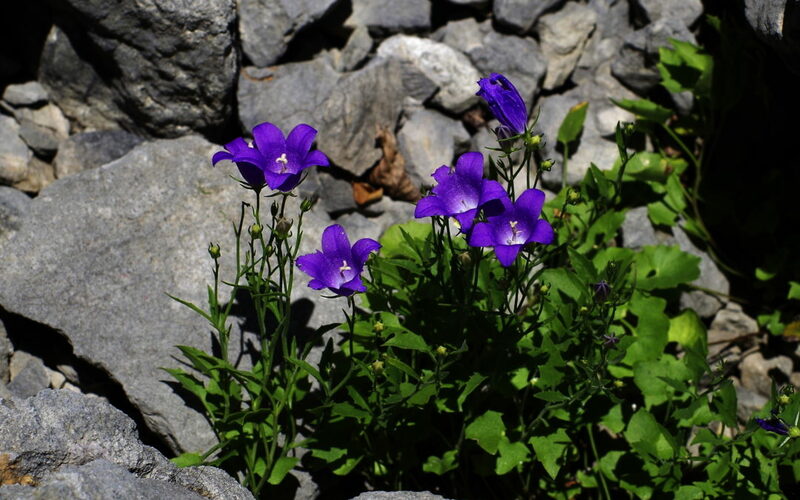 Currently I am in contact with research teams working on generas Campanula (K. Šemberová, Charles University in Prague) and Soldanella (M. Slovák, Slovak Academy of Sciences) who want to use my data for developing more reliable taxonomic system of those groups. Table 1. List of all balkanic endemics species from focal groups and their sampling in our dataset. I would like to acknowledge Marie Pospíšková and Doubravka Požárová for their help in field. Without their field expertise but also enthusiasm, the field sampling would be way more complicated. Also I would like to acnowledge numerous other people and working groups who provided us with locality information or plant samples.